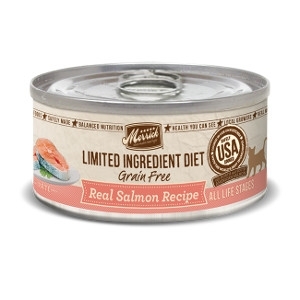 | All Things Woof Meow, Too Inc.
Limited Ingredient Diet Real Salmon Recipe Canned Cat Food, 5 oz. New Merrick Limited Ingredient Diet dry and canned natural recipes for dogs and cats keep it simple, with complete and balanced nutrition from a single source of animal protein and the fewest, most essential natural ingredients for sensitive pets. Limited Ingredient Diet Real Duck Recipe Canned Cat Food, 5 oz.